Unspoken, which will be released to the masses tomorrow, continues the story of Della Tsang, a young vampire who is struggling with more than anyone should have to bear. Her father, who barely speaks to her, is about to go on trial for murdering his sister many years ago. Della knows he didn’t do it, but gathering the evidence to prove his innocence is difficult. She’s convinced that her uncle, long thought to be dead, knows something–or is guilty of the crime himself–but she can’t find him and get answers to her questions. And why is her uncle so elusive? Well, Chase Tallman may be partly to blame for that. Chase wants to do everything he possibly can to help Della, but, just like Della is convinced of her father’s innocence, Chase is certain that Eddie, Della’s uncle, didn’t commit this horrible crime. But if neither of the brothers killed their sister, who did? And how can two vampires with their own issues work together to find a killer who’s been on the run for decades? Part of Della wants to trust Chase, but another part feels like she’s being forced to rely on him. Yes, they are bonded, but is that the only reason they are so drawn to each other? Does Della really have any choice in her mixed-up feelings for Chase? She’s spinning out of control, and Chase isn’t exactly helping. He’s trying to be honest with Della, but his omissions are just as bad (in Della’s eyes) as outright lies. What exactly is he hiding? Is he trying to shield Della from the truth, or is he protecting someone else? As Della, Chase, and an assortment of other friends at Shadow Falls work to reveal what really happened in Della’s father’s case, another heinous act is also demanding their attention. And, as they begin to examine evidence (and as Della gets information from a couple of ghosts), it seems that the two crimes are somehow linked. How is this possible? And can they find the real culprit before time runs out? Are Della and Chase ready for what lies ahead? Read Unspoken by C.C. Hunter to find out. I’m hoping we’ll see more of Della and the gang in future books. Although things are cool now with Della–and with Kylie from the Shadow Falls series–Miranda’s future is still up in the air. 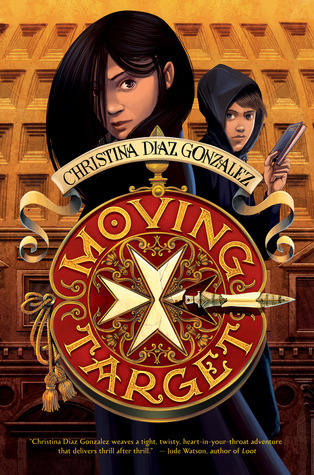 We saw a bit of her story in Spellbinder, but I’m thinking there’s a lot more to come–hopefully in a full-length novel or even an entire series. Speaking of more to come, all of the e-novellas in the series are finally coming out in print. All four of them will be released in one volume, Almost Midnight, which will be out on February 2nd. According to C.C. Hunter’s website, this collection will also feature a new story from another Shadow Falls character. No idea who at this point. For those considering adding Unspoken or any of the other books in the series to your libraries, I would recommend these stories to libraries that serve teen readers. It’s not that I don’t think some middle school students can handle it. Some likely can, but the books do have some mature situations that are more suited to young adults. Just my two cents. In closing, I’d like to thank NetGalley for giving me the opportunity to read Unspoken and the rest of Della’s story. I truly appreciate it! 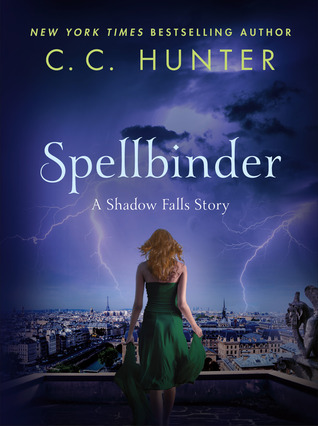 And now we have Spellbinder, a story that takes place after the events of Eternal, the second Shadow Falls After Dark novel. This novella will be released in eBook format on June 30th, and it centers around Miranda, a young witch who is trying to live up to the expectations of those around her…even when it could put her very life at risk. Miranda Kane has always been something of a klutz when it comes to managing her magic. She can never seem to please her exacting mother, who wants nothing more than for Miranda to be a Wiccan high priestess. Miranda never gets her spells quite right, and she’s sure that’s not going to change in the latest spell-casting competition her mother’s dragged her into, especially when Tabitha, Miranda’s nemesis, is also competing. Almost immediately, things get off to a rocky start for Miranda, and she can’t seem to shake the feeling of foreboding that surrounds her. Something is off about this competition, and Miranda’s not the only one that senses it. She shares her concerns with her best friends, Kylie and Della, and all of them eventually realize that someone–or something–is targeting the witches in this competition. Why? Who would care so much about a spell-casting competition for teenage witches? As the competition leads Miranda and company to Paris, the threat intensifies, as does Miranda’s confusion about the turmoil that is her life. Why does Tabitha seem to hate her so much? Why are her parents keeping secrets? What’s going on with her ex-boyfriend, a shapeshifter currently living in Paris, and why does she even care? Miranda Kane is about to get the answers she needs, but she may not be ready for what those answers might mean. How will they change her life and what she’s always believed about herself? And how will they impact her future? 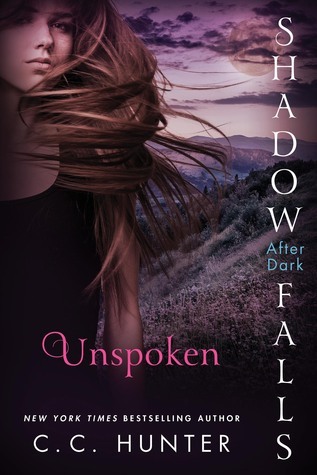 I know we’ll see more of Miranda in the third Shadow Falls After Dark novel, Unspoken, but Spellbinder has really whet my appetite for a meatier story centering on Miranda. Given what happened in this novella, I’m certain she’ll get another story, but I don’t know at this point if it will be a full-length novel. I hope it is. Remember that this story will be released to the masses on June 30th. (Thank you, NetGalley, for allowing me to read it early!) If you’re new to the world of Shadow Falls, you’ve got a bit of time to catch up before then. If you’re all caught up, I think you’ll be as pleased with Spellbinder–and its connections to the other books–as I was. For those who’d like to learn a bit more about the Shadow Falls books and C.C. Hunter, you can connect with the author on her website, Goodreads, Twitter, and Facebook. Enjoy! Thank goodness for NetGalley! I’ve only been a member for a short while, but this awesome service has allowed me to be the first to read some pretty awesome books, including the first two books in C.C. 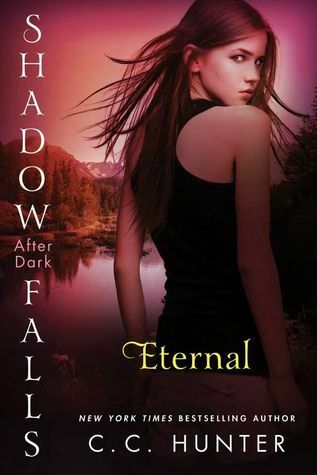 Hunter’s Shadow Falls After Dark series, Reborn and Eternal. 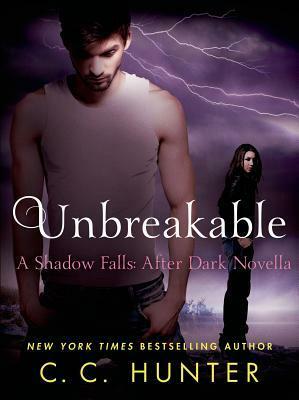 Well, just two days ago, I was invited by NetGalley to read Unbreakable, a Shadow Falls After Dark eBook novella, which will be released to the masses on September 30th. (That was a pretty good surprise on an otherwise craptastic Monday.) Of course, I dropped everything and commenced with the reading. If you’re at all familiar with the first two Shadow Falls After Dark books (or at least the first since Eternal doesn’t come out until October 28th), you already know a little about the character of Chase Tallman. He’s the oddly compelling vamp who turns Della’s world topsy-turvy. But what do we really know about Chase? How did he become a vampire? What led him to Della? Unbreakable answers a few questions about Chase, but several more are left unanswered. Readers learn a bit about his relationships with his family and his loyal dog, Baxter. We also see Chase’s first brush with love and how that eventually led him to Della. While we did see the tragic circumstances that led to Chase becoming a vampire, I do wish that part of the story had been a little more fleshed out. I wanted to see how he dealt with the aftermath. Also, there was really no mention of the whole “rebirth” thing, and I would have liked to see more of Chase’s early days as a vamp. Maybe these things will get more attention in the next full-length novel (which I think should be out next summer). If you’d like to learn more about Unbreakable and C.C. Hunter’s other amazing books, be sure to check out the author’s website here. Caution: You MUST read the entire Shadow Falls series (Born at Midnight, Awake at Dawn, Taken at Dusk, Whispers at Moonrise, and Chosen at Nightfall) and Reborn, the first book in the Shadow Falls After Dark series, before even thinking about reading Eternal (or this somewhat spoilery post on it). I know that’s a lot of reading, but it’s worth it! 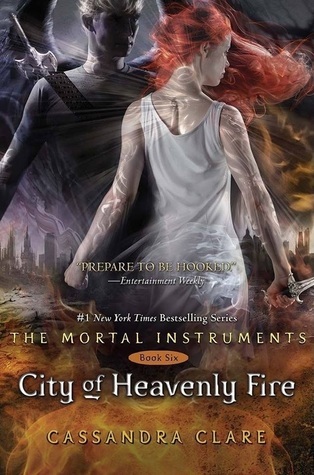 Thanks to NetGalley, I was able to read Eternal, book two in C.C. Hunter’s Shadow Falls After Dark series, a couple months early. (It won’t be released to the world until October 28th.) I loved the first series and Reborn, so I figured I’d feel the same way about Eternal. I did. After being reborn and finding herself with powers beyond what a “normal” vampire possesses, Della Tsang is more determined than ever to work with the FRU, the agency that governs supernaturals, and to uncover the mysteries shadowing her family’s past. The sudden–and not entirely welcome–appearance of a ghost will make Della’s life more confusing than ever. This ghost is trying to tell Della something about her family and showing glimpses of two captive young vampires who need to be saved from certain death. Who is this presence haunting Della, and can she figure out what the ghost is trying to tell her before it’s too late? Della is also working to unravel her feelings about two very different young men: Steve, a shapeshifter she’s been sort of dating for the past month, and Chase, the enigmatic vampire who is now bonded to her and seems to know just when she needs him. Della isn’t exactly thrilled about her connection to Chase, but even she can’t deny that her feelings for him are growing. It doesn’t help that Della and Chase are working closely together investigating a case for the FRU. Can she remain true to Steve when every part of her screams to be with Chase? And will fate take this decision out of her hands? Della’s world is in more turmoil than ever before. How is she supposed to do everything expected of her and still keep her cool? So much is weighing on her, and she’s close to her breaking point. Della doesn’t know which way to turn sometimes, and she feels like she’s being pulled in opposite directions. A mysterious ghost, Steve, Chase, Burnett, her friends, and even her estranged family. Everyone seems to want a piece of Della. But who can she really trust? Can she even trust herself to do what’s right? There is some good news, though! On September 30th, there is going to be an ebook novella released that’s all about Chase, Della’s nemesis/sometimes love interest. It’s called Unbreakable, and if you check out this announcement on C.C. Hunter’s website, you’ll learn a lot more about what’s sure to be a very enlightening read. If you love books with supernatural goodness, I strongly urge you to check out both the Shadow Falls and Shadow Falls After Dark series. Both are excellent, and I’m looking forward to seeing more of Della’s journey in the next book. For more information on the books mentioned in this post or author C.C. Hunter, visit the author’s website, Twitter, Facebook, or Goodreads. Proceed with caution! Reborn is the first book in C.C. Hunter’s Shadow Falls After Dark series. 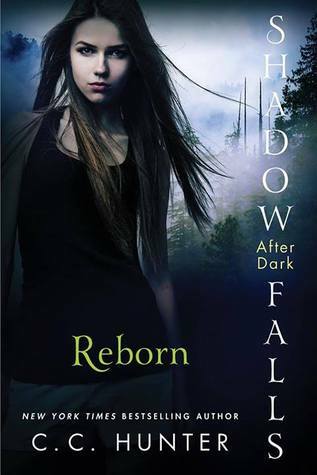 It might behoove you to read the entire Shadow Falls series before continuing with Reborn. In my opinion, it is kind of necessary to have some knowledge of what happens in the original series before continuing with the spin-off. If you need a list of these books, look below. There are also a couple of ebook novellas that add to the series and what happens in Reborn. They are Turned at Dark (Shadow Falls #0.5) and Saved at Sunrise (Shadow Falls #4.5). Reborn (and the rest of this new series, I imagine) is told from the perspective of Della Tsang, the rather moody vampire we met in the original series. Della is still living with roommates Kylie and Miranda at Shadow Falls, but she’s got her eye on a future with FRU, or Fallen Research Unit, the agency that governs the supernatural. Della just has to convince Burnett, the big, bad vampire in charge, that she’s got what it takes to be a FRU agent. This may not be the simplest of tasks given that Della has a tendency to go off into dangerous situations with little regard for the consequences. Also, Burnett has a protective streak a mile wide when it comes to any of the young women in his care. A little sexist, yes, but, considering that Della’s own family seems to have written her off, kind of comforting. When a new guy enters the picture at Shadow Falls, Della’s life gets even more complicated. Chase, a super-powerful vampire, has an air of danger about him, and Della is sure she’s run into him before, but she can’t quite place where. She’s sure he’s hiding something, but she may have to put her suspicions aside if she truly wants a place in the FRU. She and Chase are on the trail of a murderer, and any conflicts could convince Burnett to pull Della off the case that’s quickly taking over her life. Della is also dealing with the possibility that she has vampire relatives she never knew about. Apparently, her dad had siblings that could have faked their deaths because they were turned (much like her missing cousin Chan). Della is using every resource she can think of to determine if she has an uncle or aunt out there somewhere. Since her own father seems to hate her, Della is longing for some sense of family, especially family who understands what being a vampire is really like. Della Tsang is facing quite a few changes in her life at Shadow Falls. Tracking down a killer, getting a taste of her future career, a thoroughly confusing love life, trying to find her family, and so much more. You see, while all of this is going on, Della is also experiencing a strange sickness. Her senses are on the fritz, she’s running a fever (very unusual for a vampire), she’s having some pretty intense headaches, and, to really make things odd, she’s seeing ghosts. What exactly is going on here, and can Della figure things out before it’s too late? C.C. Hunter has once again packed a bunch of stuff into one book. Della definitely has a lot to deal with, and she manages to do it with the sass that we’ve come to expect from her. But we also get a glimpse of a Della we may not have seen before. Yes, she presents a tough exterior to those around her, but her emotions are often in a state of turmoil. She struggles greatly with her father’s disappointment, she wants to make Burnett proud of her, she’s fiercely loyal to her friends, and she seeks justice for the innocent. Della also wrestles with seeing herself as a monster. (We know she’s one of the good guys, but sometimes all Della can see is the fear associated with the word “vampire.”) This character wants love and acceptance, and she’s sometimes too blind to notice that she’s had it since she stepped foot into Shadow Falls. I thoroughly enjoyed reading Reborn, and I wouldn’t hesitate to recommend it–and the original Shadow Falls series–to teen readers. (It is a bit mature for middle grades.) If you think this book is worth a read, I encourage you to pick it up on May 20th! If you’re a book trailer enthusiast (like I am), you may also want to take a peek at the Reborn video below. It’s just a wee bit spoilery, but it doesn’t give too much away. And it’s kind of awesome. For more information on Reborn, Shadow Falls, and author C.C. Hunter, visit the author’s website, Twitter, Goodreads, or Facebook. The next book in this series, Eternal, is scheduled for an October 28th release. If you’re not already immersed in this fantastic series, now’s a great time to get into it. You don’t have to wait for anymore books! For now, though, I’m going to reflect a bit on the final book in the series, so be off with you if you’re not caught up! During this journey through Morganville, I’ve lamented that the main characters never have anything good happen to them for long. That doesn’t really change in Daylighters (nor would I expect it to). In this final installment, Claire and company are fighting what may be their most dangerous foe yet. 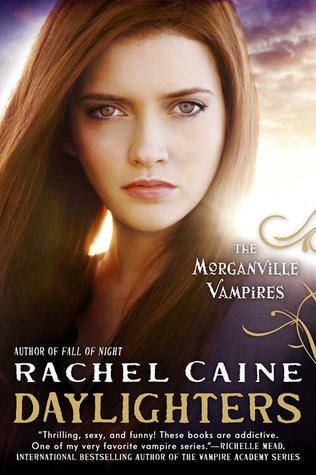 The Daylight Foundation and their charismatic leader Fallon are ridding Morganville of vampires. Sounds like it would be a good thing, right? Well, things aren’t as rosy as Fallon would have everyone believe…and Claire knows it. She and her friends see firsthand just what Fallon is doing to keep the vampires corralled, and they know things are bound to get much worse. (They’re right, as usual.) “Worse” comes in the form of Michael and Eve being split up, Shane becoming some sort of weird hellhound, Claire being arrested, and their beloved Glass House being threatened with demolition. Sunshine and roses, yes? Things may actually be sunshine and roses for many of the humans in Morganville, but there is a definite undercurrent of menace in this new order. And when Claire’s vampire allies–Myrnin, Amelie, and Oliver–find sufficient strength and will to fight back against this new threat, all bets are off. War is coming to Morganville, and, loathe as she is to admit it–even to herself–Claire wonders which side she should really be on. Should she side with the Daylighters, who are bringing a peaceful existence to many of the humans who lived in fear for so long, or should she stay with the vampires who founded this town? There really is no choice for Claire and her friends. Even though many of the vampires are truly terrifying, many more have shown loyalty to the humans in their charge. How could Claire possibly abandon Michael, Myrnin, Amelie, and even Oliver (who is grumpy on a good day)? Claire, Shane, Eve, Michael, and company will use every tool and ally at their disposal to bring the Daylighters down…but will it be enough? Can vampires and humans work together to bring down a fanatical zealot and convince his followers that a peaceful coexistence is possible? This finale, like the other books in the series, was quite the roller-coaster ride. There were times when I wondered how on earth my favorite characters could possibly get out of their predicaments. I was anxious throughout the bulk of the book, and I longed for a happy-ish ending, especially since I hadn’t got one in fourteen other books! I’m thrilled to say that, to a certain extent, I got what I wanted. The ending was rather satisfying, and I closed the book with a contented sigh. Goodbye, Morganville. It’s been an adventure.